Am I the only one who thinks that modern electro acoustics and and hybrid guitars look just too sterile? I really never did like this business of hiding away all the gubbins. "Oh, you can't have any visible pickups or control knobs, that'll spoil the illusion of this being an acoustic guitar." Huh! As if those horrible little slider controls they stick on the rim of an electro acoustic are any kind of replacement! 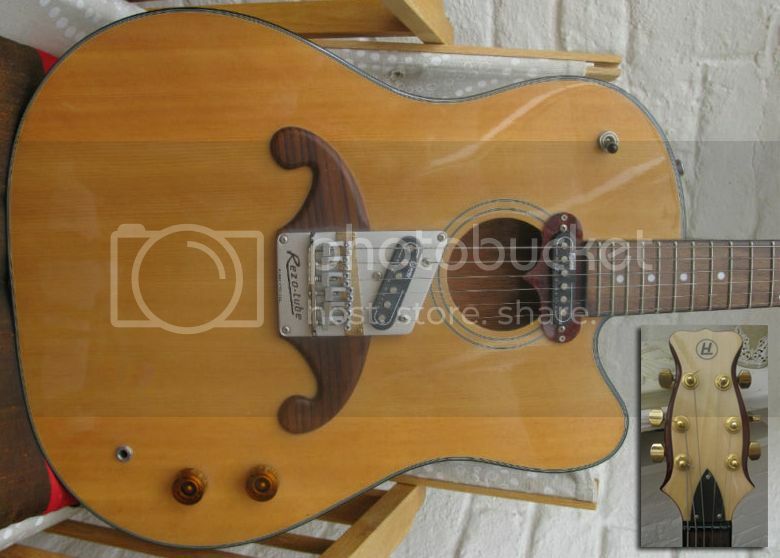 I've always liked acoustics that have obviously been electrified with pickups and control knobs on show for all to see. They can have a rather Heath Robinson appeal sometimes (Oh, if only Heath Robinson had designed a guitar! ), but to me they seem all the more honest, as if to say, "Yes, this is an acoustic but it's hardly unplugged!" Think John Lennon with his Gibson J-160E, Nirvana's Kurt Cobain playing supposedly "unplugged" with a Martin D-18E, or John Martyn with a Martin guitar with pickups obviously gaffer-taped to the guitar creating loops on an Echoplex machine (as if an acoustic could do that without all the electrickery!). So... the above pictured one-off Burns/Hayman prototype is a guitar that I find mightily appealing. It's an acoustic/electric hybrid guitar that proudly displays its electric components for all to see. I like the electric style compensated bridge set into an acoustic style "moustache" - that's a nice touch. Actually, I doubt that acoustically this guitar is very loud at all - looking at the picture of the back of the guitar (I'll put some more photos in the comments) it does appear to have a very shallow body. It's like they took the Burns Steer guitar, and made it a little bit more acoustic-y. A real collectors piece for Burns/Hayman fans 1 only made as this model was never put into production. The guitar was made over 12 years ago in the U.K. and has been sitting in the Burns warehouse since then, untouched. I'm actually surprised it's as recent as that; it looks older. Anyway, it has a starting price of £249 on it and a But It Now price of £850. Interesting 'slide' technique with fingers! Red Japanese guitar... but what is it exactly?